Former Senate president David Mark Tuesday declared to run for Nigeria’s presidency come 2019 election. Mark, one of Nigeria’s longest-serving senators, was the president of the Senate between 2007 and 2015. 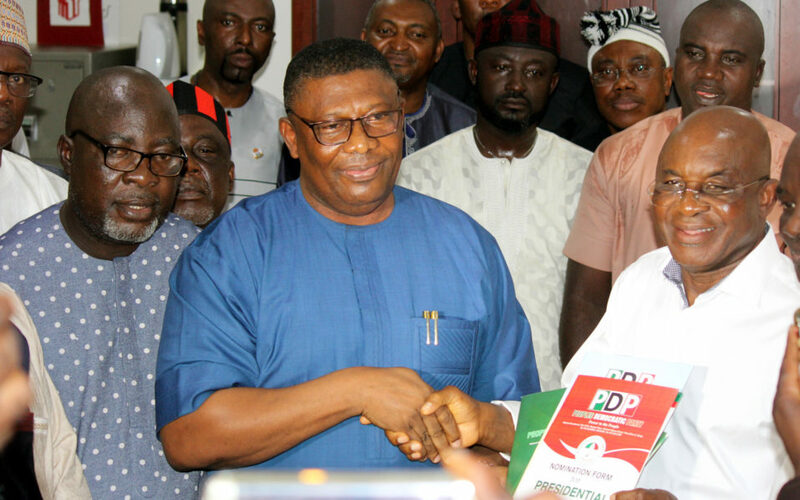 His declaration made him the fourth PDP senator to show interest in the presidency. The former Senate President said he will fix Nigeria economy in two weeks while addressing members of the Peoples Democratic Party at the Party’s secretariat in Abuja. “In two years, if given the opportunity, we will turn the economy of this country round, we will solve these security problems, we will bring Nigerians together. The level of distrust in the government today has never been experienced in the history of this country,” Mark said. Mark, who was also a retired brigadier general in the Nigerian Army, said his military background is an added advantage for him to be a competent president when elected. “I have a very good military background and has been in politics since 1998. I think I have got the credentials to be able to do what I have promised my team, He said. Mark will be contesting for PDP presidential ticket against the current Senate President Bukola Saraki, former Vice President, Atiku Abubakar and former governor of Kano State, Rabiu Kwankwaso, former Plateau State governor Jonah Jang, former governor of Kaduna State Ahmed Makarfi and Sokoto State governor, Aminu Tambuwal.